Join the discussion on our forums! Come discuss Devour Mind over in our dedicated Devour Mind discussion topic. Should be 4 mana... Weird cost if Thoughtsteal is 3 mana. I guess 1 copy card is worth 2 mana. Maybe been op with 4 mana. 5 is more "okey"/balanced. Gives you a lot of late-game fuel. Especially good for a Razakus deck. Also very cool to have golden, because all copied cards are golden. Control Priest has run Thoughtsteal in the past. Now it seems they're more likely to run this. Love the Absolution Regalia art. Tier 6 is the best tier. Nah, imagine all those mirror matchups when you Devour Mind into two Devour Minds, so that you can Devour Mind while you Devour Mind. Bigger meme than Drakonid Operative into Drakonid Operative indeed. Of course provided that this card would in the first place ever be played often enough to hope for a mirror matchup. Just another 5 mana card that gives you 3 cards. Not nearly as good as Cabalist's Tome though as that thins out the kind of cards you could get. That is not to say that this card is necessarily bad though considering that you could grab valuable cards from a control deck. I just see this being used more in Arena to keep up card tempo. I beg to differ. In a control Matchup the cards you get will be control cards and big minions. Cabalist's tome is much more random. You obviously don't play either of these cards much in an aggro matchup, so you only really compare them against control. And I'd rather take 3 control cards from my opponent's deck than 3 random mage spells. Edit: The class they are in also helps. Priest is more value centered than mage as well. Don't see why people are so harsh on this; it's Cabalist's Tome that guarantees you some pretty high end stuff in a control/midrange matchup. This is too; any control deck is going to have answers in it; that's the nature of control. Against Midrange, you're likely to steal more threats/board contenders as well as answers like Jade Lightning or Firelands' Portal. Against Aggro it's rather bad, but so is Tome. Mistress of Mixtures, Zombie Chow (I play wild, sue me), Babbling Book, Crystalline Oracle, Potion of Madness, Swashburglar, Hallucination, Jeweled Macaw and Glacial Shard all seem like decent things to pull, even in the late game. But it's pretty significant that you you are gaining 2 cards for this. With thoughtsteal you are gaining one card, and the first card is probably less good than a card you could have put in your deck. IMO it's much better when you gain 2 cards. That's twice as much gain. 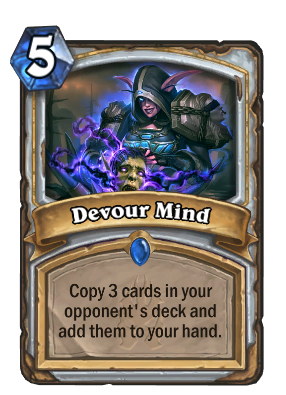 For just one Devour Mind you would have to draw 2 thoughtsteals. The fact that you don't need to draw them both is significant.